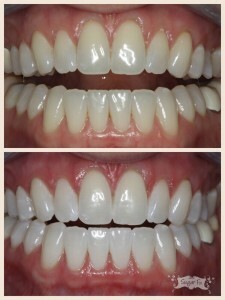 Before and Afters of Cerec and Zoom! This week was very busy at the loft! Several of our patients were getting a jump start on their spring cleanings! We saw many friendly faces entering The Loft for their first cleaning experience! It was so great to meet friends or significant others of our long- time patients. Sharing stories and making patients feel comfortable and at home is always our number one goal. If you have any friends or family interested in coming to a new office, Dr. Emery loves to meet new guests and help with any dental issues they may have. As always, the Cerec was in full effect this week with a total of 14 restorations completed! The results are truly amazing every time and our patients love them. During the treatment time, we give each patient a break or two for tv time or time to check email. This breaks up the appointment nicely and is very much appreciated by our guests. Below is a full lower left quadrant of one of our patients. 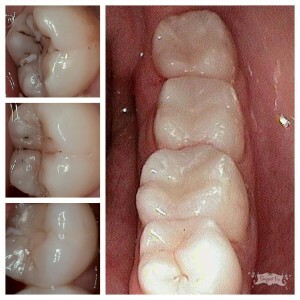 As you can see, the old restorations with decay have been removed, and flawless Cerec fillings are in their place! We had a few ZOOM! first time patients who were excited to leave with a cleaner, whiter smile. Their results were great and with their take home bleaching trays they will be able to maintain their pearly whites when they want to brighten up! Below is a before and after of one of our ZOOM! procedures. To end the week, we at the loft would like to wish a Very Happy Birthday to our very own, Dr. Emery! We had a mini-celebration to close out the week and spent some time eating cake and hanging out with our favorite boss. Below is the cake we presented to her from Dinkel’s Bakery, one of our favorite neighbors! 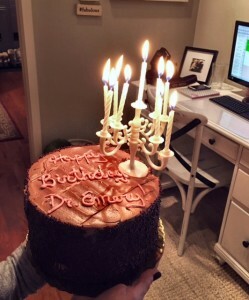 Dr. Emery’s birthday cake with chandelier! We hope you have a wonderful weekend! Looks the temperatures will be warming up a bit, just to really tease us that spring is right around the corner!